Nintendo 64 Console. Power Cable. 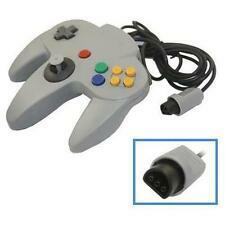 New ListingNintendo 64 Console with Controller, AC Adapter, and Video Cable! System has been tested and works great. 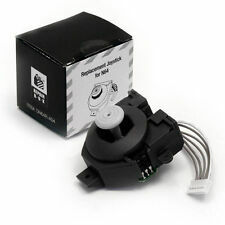 N64 Jumper Pak. 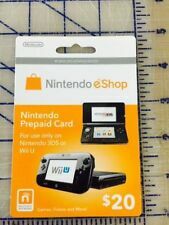 Quality Nintendo Brand! BUY WITH CONFIDENCE! FREE SHIP! This is Japanese version of Nintendo 64 console and it is usually region locked. However, the slot tray of the console is replaced with the 3D printed region free slot tray (PETG material was used for 3D printing which is more durable and heat resistant than PLA material.). You get all 4 for one money. 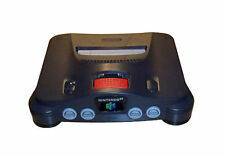 Complete Nintendo 64 Console N64 System (NTSC) NUS-001 Charcoal Black. The system pictured is the system you will receive. Refurbished Nintendo 64 comes with Star Wars Shadows of the Empire, WWF Attitude, Bomberman 64, SuperCross 2000, Waialae Country Club Golf, All Star Baseball 99, power adapter, a/v cables, and 1 controller with a tight analog stick. The Console been Cleaned inside out and had the contacts cleaned. The games have been taken apart and had the pins polished. Everything has been cleaned, tested, and works great!!! Please check out my other listings!!! Nintendo 64 Console Bundle (As Pictured). Nintendo 64 Console with AC Power Adapter (Missing AV Cable) Not Included. The Console Works Good. Killer Instinct Gold. New ListingBanjo Kazooie~ Nintendo 64 ~ N64 ~ Tested ~ Authentic ~ Ships Fast! For sale is Banjo Kazooie for the Nintendo 64. It is tested and works great! It is in good condition! 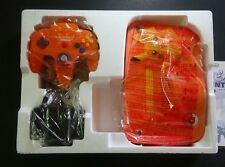 This auction is for a Nintendo 64 (N64) video game console with two games. The games are Goldeneye 007 and Bomberman. Comes with 1 controller and all cords. Used in great condition. Buyer has two days to make payment. Paypal only. I only ship within the connecting 48 US states. Please look at pictures and know what you are buying. Ask any questions you may have.5 DAY AUCTION!! Comes with 6 games, 1 controller, power cords and console. Console has a few scratch marks and little white specks does not mess with the performance at all. Turok 2 has some writing on it, excitebike has a sticker on back cover and controller joystick is loose but besides the minor flaws everything still works great All games have been tested and are in working condition as shown. For more details feel free to ask and thank you for looking. We fulfill orders M-F each week. This does not impede the function of the console in any capacity that we could notice during testing. The console has been tested and appears to be working properly. Mario Party Nintendo 64 100% Authentic Used Very Good. Pilotwings 64 (Nintendo 64, 1996) N64 . Condition is Very Good. Shipped with USPS First Class Package. Ships Next Day PRIORITY! Tested and Guaranteed to Work! New ListingNintendo 64 Launch Edition Console - Grape GOOD CONDITION!! Nintendo 64 Launch Edition Console - Grape GOOD CONDITION!!. Condition is Used. Shipped with USPS Priority Mail. NOTE: Game system and controller work perfect with no problems! Both may show signs of wear, overall condition is good may need a little clean up. All wires and expansion pak are OEM ( Nintendo Brand ). What you see in the photo is what you will be receiving. Please contact me with any questions! Thanks! And god bless! 5 out of 5 stars - Nintendo 64 Launch Edition Console - Grape GOOD CONDITION!! 32 product ratings32 product ratings - Nintendo 64 Launch Edition Console - Grape GOOD CONDITION!! Aidyn Chronicles for Nintendo 64. Nintendo 64. Nintendo DS. Nintendo NES. Super Nintendo. Sega Genesis. Sega Dreamcast. Playstation 3. New ListingMega Man 64 (Nintendo 64, 2001) - Tested and Working! The item has been cleaned, tested, and has been found to be working. 4.5 out of 5 stars - Mega Man 64 (Nintendo 64, 2001) - Tested and Working! 45 product ratings45 product ratings - Mega Man 64 (Nintendo 64, 2001) - Tested and Working! New ListingNintendo 64 bundle with 7 games and expansion pack! The Item is Used & Fully Tested. Item is in Vert Good condition. Lot Includes 7 - Mission: Impossible. 6 - NBA Live 99. 5 - In The Zone '99. Japanese N64 Console - Nintendo 64 Console with power cord and av cable. Condition is Used. Major League Baseball (Ken Griffey Jr.), NBA Live 99, International Superstar Soccer 64, Banjo-Kazooie. Nintendo 64 Console USA Edition In Great Condition. This does not include jumper pack, controllers, or av cable. This Nintendo 64 will be cleaned and sanitized before it is sent out. As seen in the last picture, the console does power on and is in great condition. The Nintendo 64 is the third major home video game console from Nintendo. 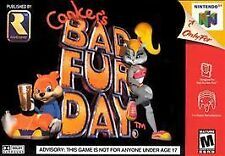 Initially released in 1996, it was one of the first consoles to offer full 3D gaming, an analog stick, and four controller slots. Purchasing an N64 allows you to revisit hundreds of exclusive and multi-platform titles such as "Super Mario 64," "Super Smash Bros.," "Goldeneye," and "The Legend of Zelda: Ocarina of Time." What kind of accessories were released for the Nintendo 64? 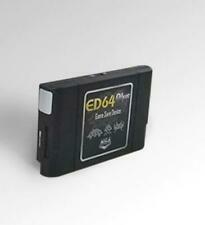 Controller pak: This is a memory card that stores a small amount of game data. It plugs into the back of the N64 controller. Because game saves could be stored on the cartridges, the memory card was only used to transfer data or store large files such as replays in sports games. Rumble pak: This accessory plugs into the N64 controller and provides a vibration to match the action happening in the game. Expansion pak: The expansion pak doubles the amount of RAM in the Nintendo 64 from 4MB to 8MB. This had an impact on the graphics. 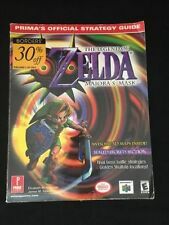 "Donkey Kong 64," "The Legend of Zelda: Majora's Mask," and "Perfect Dark" all required the expansion pak to play. 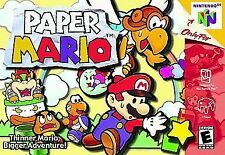 Other games used the expansion pak to boost the image resolution or texture quality. Transfer pak: This pack allows you to transfer data between the N64 and the Game Boy or Game Boy Color. 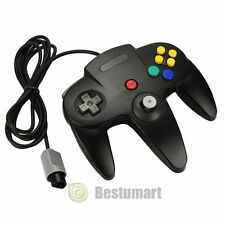 It is compatible with select games such as "Pokemon Stadium." 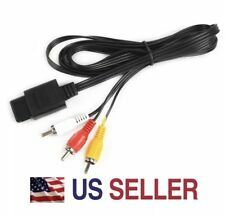 S-video cables: S-video provides better picture quality compared to the standard composite cables that came with the Nintendo 64. Does the Nintendo 64 feature a region lockout system? Yes, that means a game from one region cannot be played on a system from another region due to physical differences between the game cartridge and the console. The regions are generally divided between NTSC-U, which encompasses North America; NTSC-J, which encompasses Japan and Taiwan; and PAL, which encompasses the European region and Oceania. The Nintendo 64 system would need to be modified to accept game cartridges from a different region. How many different colors were released for the N64? Apart from the standard black console, Nintendo released several semi-translucent colors under the Funtastic series. These colors go by the names of fire orange, watermelon red, jungle green, ice blue, smoke black, and grape purple. 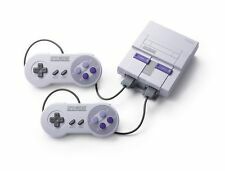 Nintendo also released several limited editions. This included a console inspired by "Pokemon Stadium" featuring a unique color scheme and decals from the Pokemon franchise. Three Pikachu editions were released in light blue, dark blue, and orange colors. 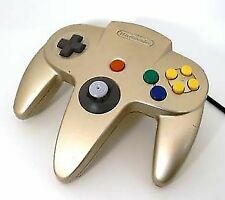 Finally, a gold-colored console was also produced with matching gold controllers.